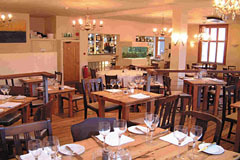 Clock is a modern, bright and spacious restaurant-bar on the Ealing/Hanwell borders. Drop in for a drink or snack in the bar where there are relaxing comfortable sofas and polished antique wooden floors. In the restaurant, select from a superb a la carte menu complemented by a reasonably priced well selected wine list. A perfect venue for all occasions including weddings with attentive service and attention to detail guaranteed by Tim and Kerry. Open Tue-Fri 12-2.30pm and 5-midnight, Sat 5pm-midnight (last orders food 10pm Tue-Sat), Sun 12-4pm. All major credit cards accepted (not Diners). 12.5% service charge.